Kurt Vincent’s “The Lost Arcade” is an ode not to gaming but the community that sprouted up around it, particularly during the arcade craze of the ‘80s, and how home consoles and the changing real estate market in New York City affected an institution. Opening in the early ‘40s, the Chinatown Fair flirted with worldwide fame, particularly with its dancing chicken (featured on David Letterman’s show and even in “Falling in Love” with Robert De Niro and Meryl Streep). Before the Nintendo Home Entertainment System changed gaming forever, kids went to arcades to play games in places like Chinatown Fair. In the early ‘80s, it was such a phenomenon that there were popular establishments all over New York City, including Playland in Times Square. As larger arcades became more popular, Chinatown Fair remained, strengthened by the loyalty of its customers, especially those who made it a hotspot for fans of fighting games like the “Street Fighter” series. But time changes everything, and Chinatown Fair has changed even since Vincent started making his film. 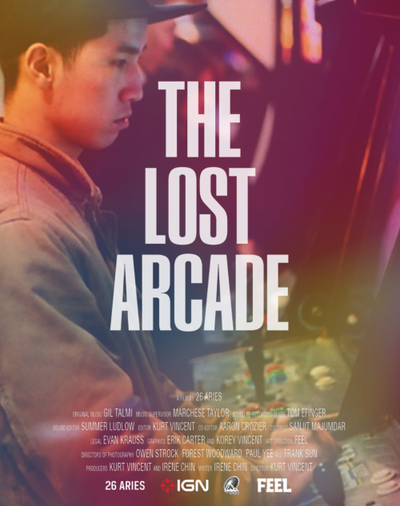 At its best, “The Lost Arcade” captures the sense of competition, community and commitment by these people, many of whom saw Chinatown Fair as not just an escape but a home. “The Lost Arcade” is more interested in the people who came to Chinatown Fair than what they played when they got there. Sure, you’ll hear a story about how the Capcom decision to not release an arcade version of “Street Fighter IV” nearly destroyed the place, but it’s a film way more interested in why people spent hours in the Chinatown Fair than their favorite finishing moves. To that end, we meet not just the regulars of Chinatown Fair, but the people so regular that they became employees, including the fascinating Akuma Hokura, who was homeless when he discovered Chinatown Fair. So enraptured by what he found there—and subsisting off quarters he found under machines—Akuma turned it into a home, eventually being given a job there to get him off the street. In a sense, Chinatown Fair was a place for people who had nowhere else to go. They formed friendships there. They grew up. As Hokura says, “It was the one place I didn’t feel like anything was wrong.” And then the real world intervened. It’s no spoiler to say that Chinatown Fair struggled as the home console market decimated the entire business. And several of the key players in the story of Chinatown Fair, and the establishment itself, had to adapt to survive. The final act of “The Lost Arcade” is surprisingly hopeful (given the title of the film) in the way it details how public gaming has changed: incorporating live streaming of tournaments, shifting focus to music/rhythm games and being more welcoming to female gamers—there’s a notable lack of them in the archival footage and stories of the “good old days” of Chinatown Fair. Vincent moves too quickly over some of the elements that defined Chinatown Fair and have impacted its development. It’s understandable that he wants to spend as much time as possible with people like Hokura, but there’s a brief soundbite from a Capcom exec during the “Street Fighter” anecdote and I would have loved to hear more from a company man like that about the changing face of arcades. There’s also a fascinating bit about the very concept of “Public Play” in which a writer for Kill Screen talks about a place where kids who can’t afford home consoles go to be with friends and play their favorite games. Gaming is, primarily, a solo experience, and yet it’s one that people want to share with each other. Chinatown Fair was a great case study in the concept of “Public Play”—how much people need to share the joy they get from playing. Chinatown Fair gave people joy. It gave people community. It gave some people a home. And it inspired a filmmaker so much that he wanted to capture that feeling on film. And that’s the greatest power and accomplishment of “The Lost Arcade.” It really does take us there and illustrate why this place mattered to so many people. It made me want to go find some quarters and head down to the arcade myself.